Previously, AIMed did a comprehensive coverage of robots and their respective roles in healthcare. Although these automatons assist in relieving the workload of healthcare professionals, they are still imperfect in some ways. One of which is dexterity. Often, human and animals are able to carry out certain tasks like grabbing or turning with grace and ease. Some are so effortlessly performed that attention is almost redundant. However, in the eyes of a robot, none of these physical gesture can be taken for granted. Fundamentally, classical control theory forms the basis of robotic movements, as software conjured from mathematic models instructed automatons to act in a predictive manner. The whole process starts off with simulations; researchers would formulate the robot’s actions virtually before placing the software into the robotic body for manoeuvre. Physical limitations as a result of friction, hardware immaturity and environmental inconsistencies create what known as a simulation-reality gap. This means robots are unable to acutely act out what is written in the software. Recently, a group of scientists had successfully closed the gap by integrating classical control theory with machine learning techniques. They first designed a standard robot for the purpose of collecting data from its actuators, the part which guided its movement. The team then feed the data to an artificial neural network of a second machine. Eventually, the second machine will be trained in a simulation. Researchers noted that such hybrid model robots are able to perform tasks in a quicker and more accurate manner. Just about the same time, a separate group of scientists are trying to give command to small clusters of robots via virtual reality (VR). In the experiment, the operator navigated the robots, by picking them up or moving them around in the virtual arena. The Leap Motion gesture-tracking technology attached on the exterior of the VR headset picked up the actions and transmit them to the robots using radio signals. The research demonstrated that an untrained operator was able to “move” 50 robots into three independent locations within five minutes. The third group of scientists looked into the “particle” robots. When stands alone, these circular automatons can only open and close like a heartbeat. When they are placed in a group, these robots are able to proceed towards a light source, carry items and bypass obstacles, without prior planning. The functionality of these robots is rooted in stochastic mechanics. Its output relies on a system rather than individual counterpart, like any biological systems exist in nature. As such, even if a part of it fails, the overall performance will not be affected. The robots are also free to be organized in any way without a centralized system. The flexibility of particle robots reassure researchers that they can be placed in any environment, even novel ones. Its size may also be reduced to fit into a human body. Researchers believe these robots may one day, be used for “cleaning up areas or to exploring unknown terrains/structures”. Likewise, robots with improved dexterity and manipulated with VR could lead to better machines serving in the interests of human. Imagine patients who can command their robotic assistants without having to move extensively or machines that can bring patients out or for medical appointments without any prior programming. As we fantasize the possibilities, researchers are not concerned with the amount of data required to ensure these robots really work as they intended. Besides, as human movements are guided by self-awareness, scientists are beginning to wonder if robots can truly master dexterity without apparent consciousness. Nevertheless, the above is current breakthroughs that believe to form the basis of more similar studies that we can look forward to. 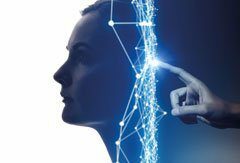 PreviousPrevious post:Get ready for the next AIMed breakfast briefing: Experience the future of AI in RadiologyNextNext post:Who should be included in the AI diversity talk?